In M. Ainihi’s second book, Lost, from her Blood Inheritance series, Amanda is plagued by visions and a monster that invades her sleep and wakes her with bruises. She doesn’t know what the visions are trying to tell her, so she tries to find the connection between them by focusing on the two that draws her in the most: Emily and Kiami. Emily thinks her healing powers are a curse but she uses them anyway to save her best friend. She runs away afterward, not wanting to be confronted by her parents’ hatred for what she had done and afraid of what other people will do if they find out about her. Kiami, on the other hand, had been loved by her mom and aunt. They both tried to understand and nurture her magical abilities, and never questioned her intentions, focusing instead on teaching her right from wrong. However, a tragedy broke apart her small family and she finds herself alone and desperately looking for people like her and anyone that would not be affected by her powers. M. Ainihi has outdone herself again with the sequel of Amanda’s trials and adventures. In Lost, Amanda continues to search for her mother, frightened about the truth she may uncover. I love how in the very first part we delve into the thoughts that go through Amanda’s head and how, despite the confidence she projected on the outside, deep inside she was as unsure as you’d expect a teen her age would be when faced with all these complicated and impossible situations. It made her seem more humane and drew me further into the story. Another thing that really grabbed and twisted my heart was when Amanda wrote down: ‘Am I a hero or a villain?’ It showed how conflicted she was about the choices she had made and was currently making and it just made me see how amazingly this character has progressed throughout the series. Emily and Kiami are two new wonderful additions to this amazing piece of work. They’re each powerful in their own way and have experienced hardships that just make me want to wrap them up in a blanket and protect them from any and all monsters. Honestly, this book is everything I never thought I needed in an epic fantasy plus more! It’s an enjoyable read with creative twists on mythology and I won’t be surprised if it captivates all who decided to read it. It definitely caught me, hook, line, and sinker! Lost by M. Ainihi is the second book in the Blood Inheritance Quartet. Amanda is on a search for answers about her visions which lead her to Emily and Kiami. After Emily saves her friend, she has no choice but to run away and turns to magical wisps for help. Kiami is determined to find someone immune to her unique abilities with song so, when she receives an opportunity to help Amanda and her jinn ally, she takes it. Amanda has a vision of Emily but she doesn't understand the message. As her powers seem to be growing, they begin to scare her. As the world around them becomes more dangerous, the three turn to each other to find answers to a complicated mystery. Lost consists of three connecting journeys following the perspectives of Emily, Amanda, and Kiami as each is searching for answers about themselves. The structure strikes a balance between the three perspectives as their stories weave together while also exploring their own personal journeys. Each of the three has an unique gift they don't necessarily want and provides a source of conflict for them so a majority of their individual stories is exploring what their gift means for them. Their journeys have a self-discovery to uncover as their powers grow and their surprising connection is revealed. Amanda wants to know more about her visions which are rooted in why she's drawn to Emily and Kiami. This connection also gives some mystery as they work to understand what connects them to each other. Her strongest ally is Aden, who is constantly at her side so his loyalty is important to her and helps ground her, which adds a warmth to their friendship. They have an understanding of each other shown through their interactions. The visions are something Amanda sees as a burden so, as her powers grow, she's scared and has to work her way through in order to come into her own. Emily is on her own after she saves her friend's life therefore changing her own, which drives her to take off out of fear and embark on a dangerous journey. This journey leads her to an unexpected place where she actually finds somewhere she could belong and connects to people who offer a new perspective on who she is. She's always been told her gift is a curse so she's been afraid of that part of her in a similar way Amanda fears her visions. Kiami's life has been the opposite of Emily's as she's been protected and her gifts nurtured. She has a power of transformation which is a key part of who she is and weaves into how the story plays out. She's quickly drawn into helping Amanda, linking up their stories as they interact. The mystery is quickly built up with growing danger, their connection, and through each of their magic. M. Ainihi weaves a tale of magic and mystery in Lost which follows three unlikely people with gifts who form a connection that could be what stops a growing danger. Lost is a work of fantasy fiction written for young adults, and penned by author M. Ainihi. 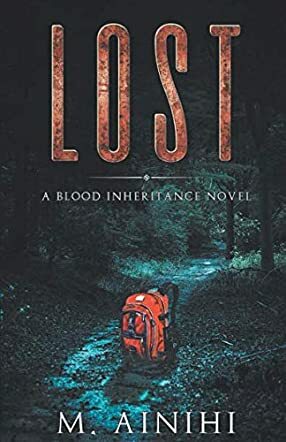 A novel in the Blood Inheritance collection, Lost follows on from the previous book, Rise, to give us the continuation of Amanda Garrett’s story. Amanda and her jinn companion Erol have already survived several horrors during Amanda’s discovery of the other realms around her, and now Amanda is having visions that spur her into action. She makes a vow to help Emily and Kiami, who both have very different magical powers, and along that journey her own powers grow to haunt her in her waking hours as well as her sleep. What follows is an epic mystery with plenty of dark danger. The thing which impressed me the most about M. Ainihi’s world building was the jinni concept and how well created and developed the jinn are throughout this tale. The comparisons between half jinni Justin and full jinn Erol were intriguing, as well as the connection that Amanda feels towards her companion now that they are bonded. The plot flows well and really suits the young adult audience, never over-complicated by too much detail at once, and revealing different elements of the different people and their magical powers as it becomes relevant to the story. As such, Lost reads quickly and smoothly, moving between well-described action sequences and dark scenery to more emotionally crafted moments where readers can relate to the cast, particularly to Amanda and Emily. Overall, a recommended fantasy read.